DFKI, together with partners Airbus Operations, Broetje Automation, EngRoTec, and The Captury, developed a technology demonstrator for scenarios in hybrid manufacturing in the aircraft construction industry. 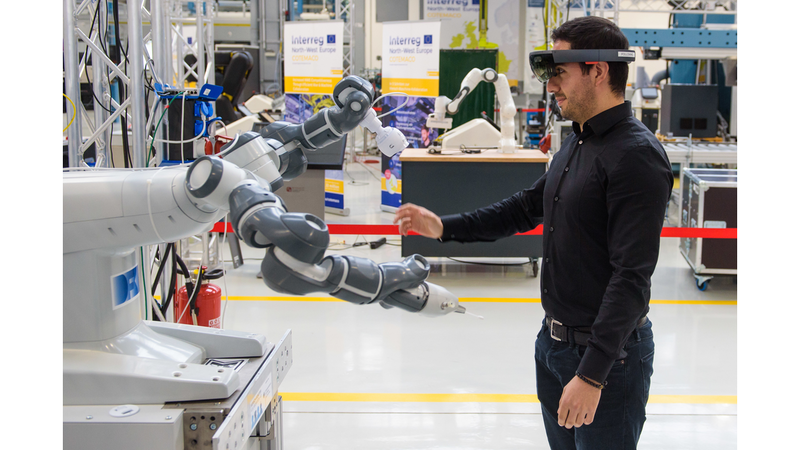 The demonstrator represents the results of Project "Hybr-iT - Hybrid and intelligent human-robot collaboration," which was funded by the Federal Ministry of Education and Research (BMBF). Partners at the DFKI stand (Hall 2, C59) are exhibiting how two people and six robots jointly master manufacturing tasks as a hybrid team. The robots perform the jobs that are non-ergonomic, repetitive, or physically strenuous for people, for example, the seating and sealing of rivets in an aircraft body or the assembly of the cable channels in the wings. The robots "organize around the humans," achieving the freedom and flexibility to complete their production schedule. Humans perform the tasks that require higher cognition or sensory motor skills, such as fine adjustments and quality controls. Support is provided by means of an AR application and HoloLens glasses. The demonstrator is based on a controllable service-based infrastructure for Industrie 4.0 production systems, supplemented and enhanced by a resource-oriented architecture (ROA). The ROA enables the deployment of distributed components and sensors and access to them. Existing and new elements can be integrated with the ROA using Web standards.